Grandmas everywhere are just waiting to get something "grandchildren" oriented for Christmas. Make it easy on yourself and order a keepsake bracelet from Heritage Makers. 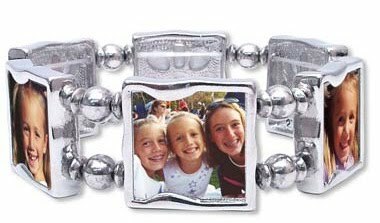 Upload 6 photos and they are inserted into the the frames in this silver bracelet. I love gifts with a lot of sentimental bang for not much effort. One winner will receive their own Heritage Makers Keepsake Bracelet. Head over to Heritage Makers and check out some of the fab products. Leave a comment here letting me know some of your favorites. For a second entry, mention in a separate comment that you are a natalie's sentiments follower. For a third entry, grab my button and place it in on your blog. Let me know in a separate comment that you have done so. For a fourth entry, let me know in a separate comment that you have voted for me in the Divine Caroline Love this Site Award Contest. It ends soon, so make sure you vote! For a fifth entry, blog, tweet or facebook about this giveaway and let me know in a separate comment that you have done so. I will announce the winner on November 30th. Good Luck! See complete rules and eligibility here. The winner of the Bell Design Giveaway is Misty. Congrats! Email me and I will get you your prize! I love their story books! I love tge swatch book idea! what a great idea! I love the "My Love is Forever Canvas"! I love the swatch books and all the jewerly. There story books and all the jewelry are awesome! I had been wondering what to get my MIL, you may have just given me the answer! I love their canvas'. I think it is so pretty to see a canvas vs. a regular picture all the time. I love the story books! I love the calender templates they have. I love the swatch books and the single pendant necklace How fun! I LOVE those story books. I think I'm gonna have to order a couple of those. I'm finally getting in on the action! I love that you can make your own playing cards. That's a really cool idea! The HM keepsake bracelet is really my fav. I love their Christmas cards... totally unique and saveable! I adore the three-charm necklace. I love it so much I am ordering one for my mother-in-law. I think she will think it is just awesome! The 7 panel cards are pretty sweet and so are their photo books. Thanks! What an adorable bracelet! I love their birthday boy greeting cards. I love this bracelet! My grandma would LOVE it! What a cute idea! ♥ I love the calendary and swatchbooks! Cute! I love the 13 x 11 Storybook. I love the Playing cards. I just faced book you. I love the little 5x5 storybook; a perfect size for the bookshelf! I also think the swatch-book would be a great thing to make for the grandparents! I voted for your blog at Divine Caroline's Love This Blog Site. Am I too late to enter? Well, regardless, I wanted to say I love the Heritage Makers cards! So cute! I love the pendent necklaces!